Another challenge, I know but this one I can't turn down and I mean to sign up last week and forgot. 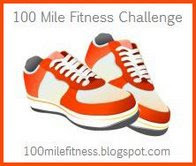 Its the 100 Miles Fitness Challenge! Click on the link to take you to the official rules. Its pretty simple. The goal is to walk/run 100 miles in 3 months! Other exercise counts too but only running or walking is mile for mile. C'mon, who can't do 100 miles in 3 months? Thinking of joining and need a place to keep track of your mileage? C'mon over to Daily Mile and friend me! We can motivate each other. Speaking of exercise, tonight is my first Zumba class of this session! Am looking forward to it, especially since a good friend registered with me and we're hanging out together for a bit afterwards!